Today I wear this skirt with one of my t-shirt re-makes that I teach in my classes. Below is the original post with tutorial, enjoy and I hope it inspires you to go digging in your old linens and remake something fun! 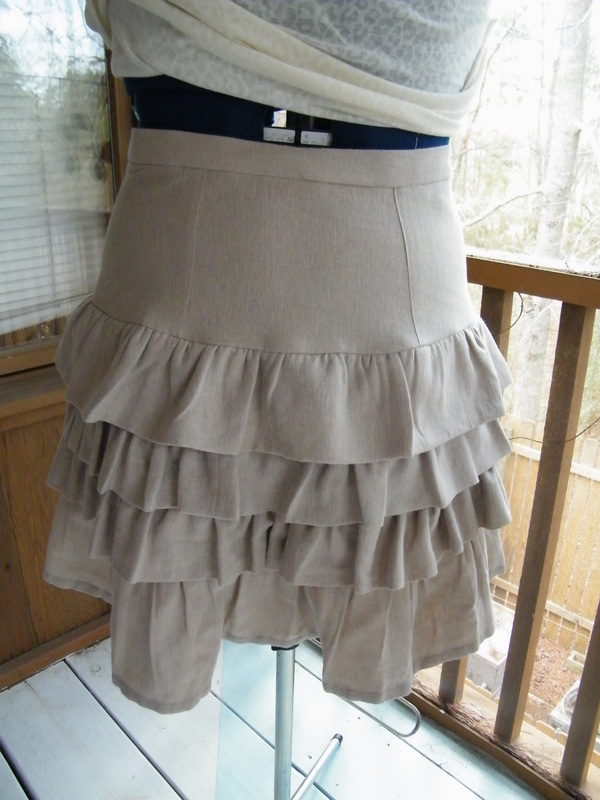 This is my Favorite Skirt…. 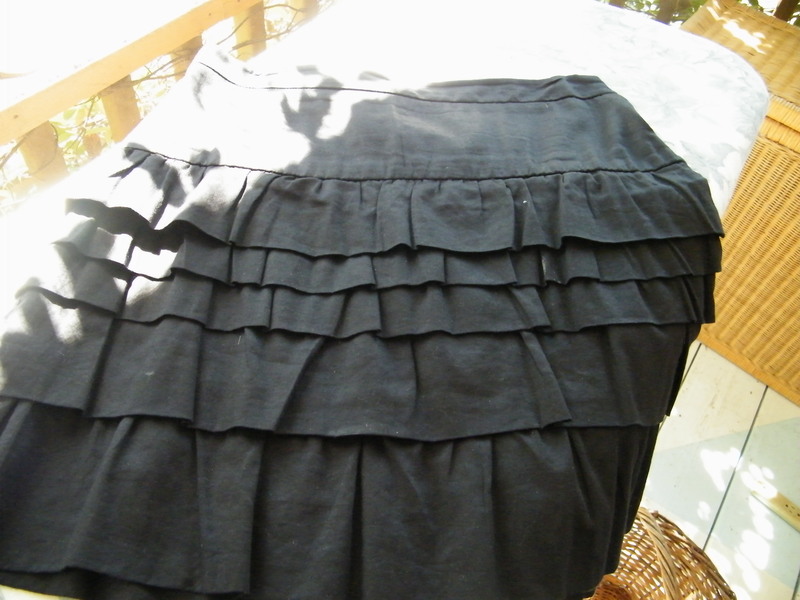 It’s a black, short lightweight skirt with ruffles. 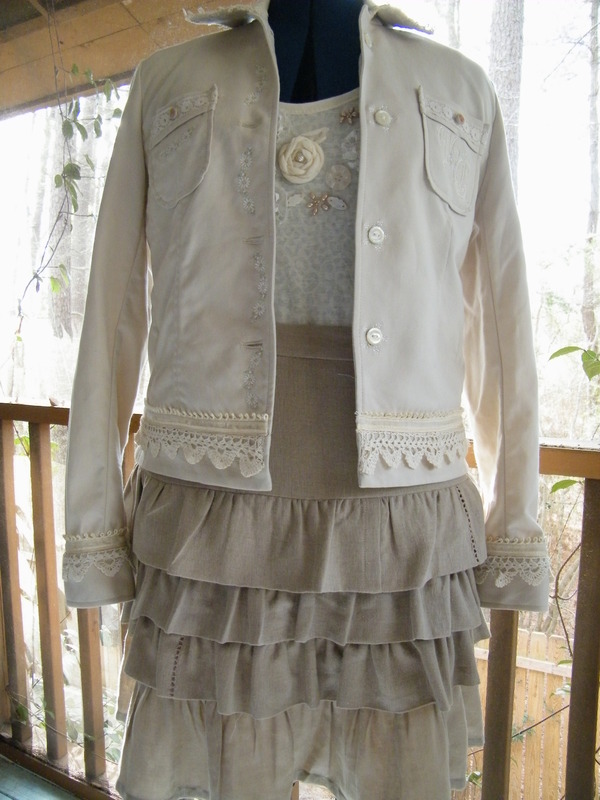 I wear it with tights and black boots . I just feel good in it! Since I fixed up my jacket I was thinking about what to wear with it?? and I knew I wanted to copy that skirt! So I dragged out an old stained linen table cloth and some other random linens to match. I wanted a vintage-y feel so Linen seemed best. My orginal thought was to make each layer a different linen color, with the table cloth being the base fabric. As I was trying to make that work I realized the linen was a heavier fabric than the cotton sateen of the black skirt, so I abandoned that idea for now and just used the table cloth. I love this skirt so I just wanted to copy the pattern without taking anything apart. 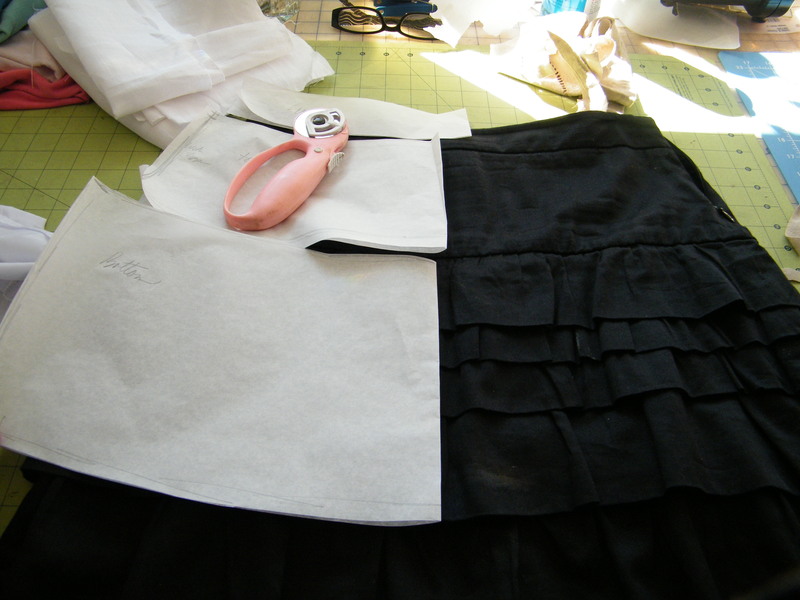 I laid tissue paper down first then placed the skirt on top and made “pin-holes” through the skirt and on to the tissue paper. Then I just connected to dots on the paper to make the pattern pieces. I am showing the pattern piece which will be placed on the fold of the fabric. I needed the waistband, top yoke and bottom underskirt pattern. 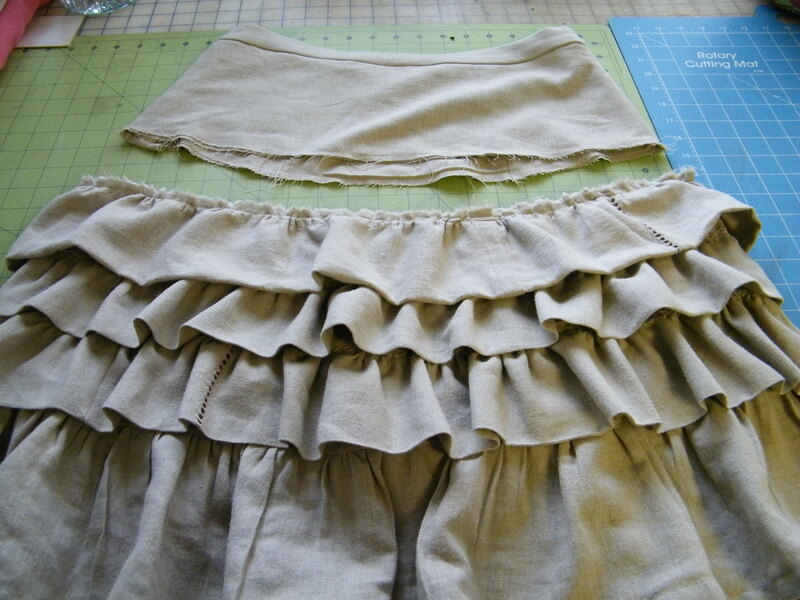 For the ruffles I cut straight lengths based on the measurements of the ruffles on the original skirt. 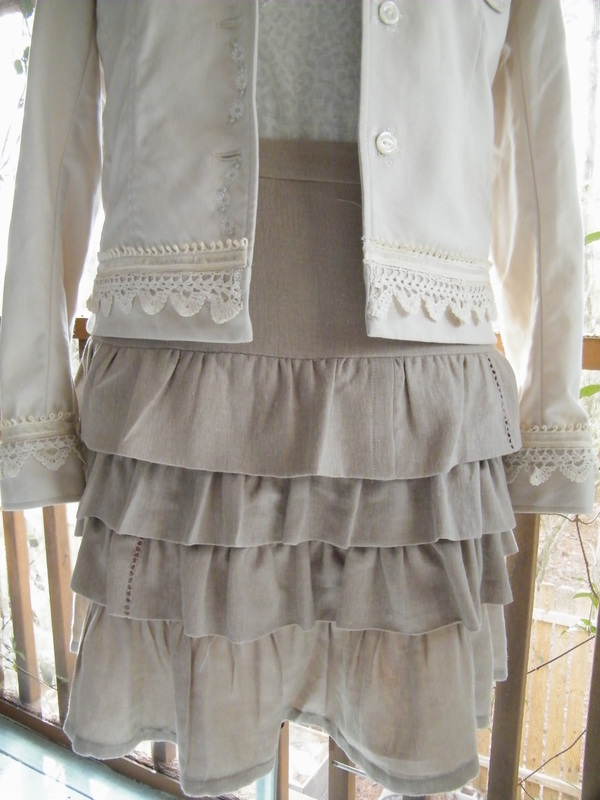 That skirt also has a neet thing, the ruffles are different lengths. SO I went with that. 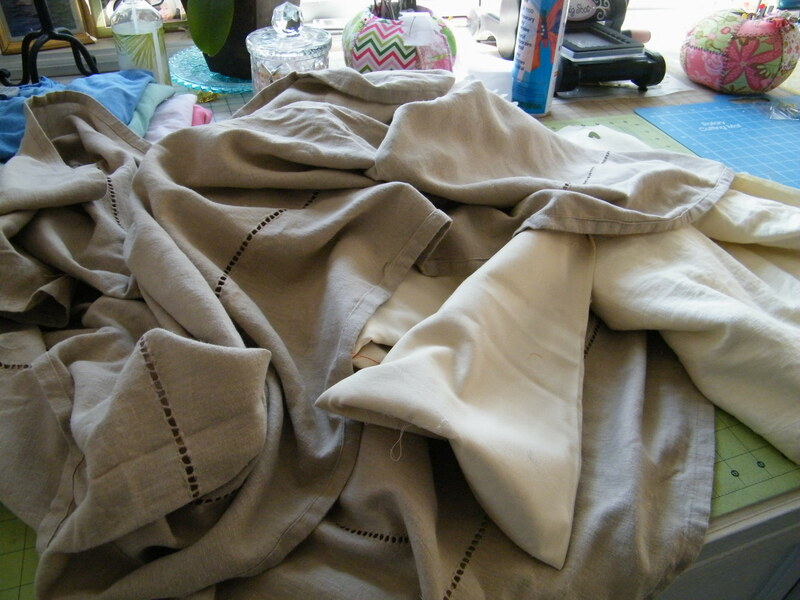 Again the linen table cloth fabric was heavier than the Cotton so I took out a row of ruffles to help with the weight. I made the top section first with the zipper in the side seam. 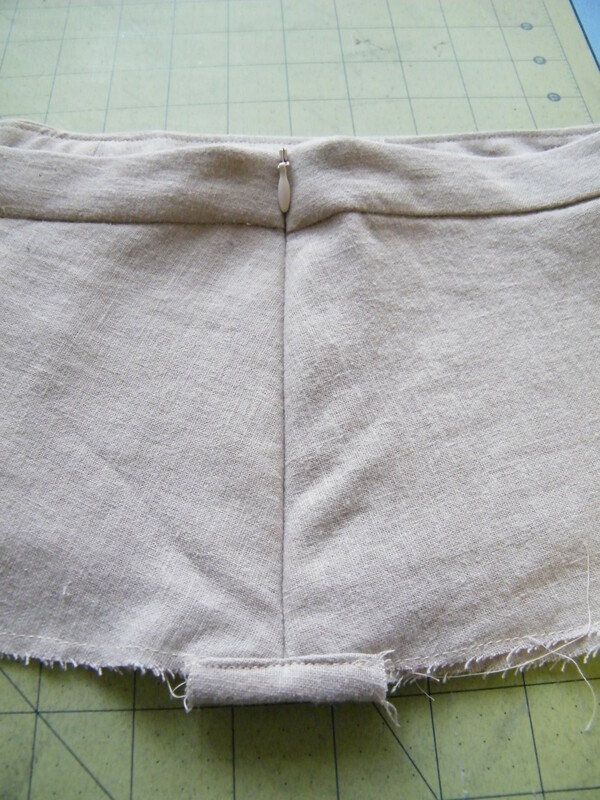 (I laid out the zipper section so you could see it… it is really in the side seam. )I like to finish off the ends of zippers since I usually never ever have the shorter sizes, I just fit the zipper in and cut the remaining length. Invisible zippers are easier to put in that way too. I worked on the bottom half all in the round so I wouldn’t have any seams showing or ruffles sewn into the side seams. This makes for a smoother finish. The table cloth had a hemstitch accent around the border. I just incorporated that into some of the ruffles. If I make this skirt again, I would like to make it out of the lighter Cotton sateen because it lays so flat even for being ruffles. I think because I took out of row this fabric works. I also somehow want to make a skirt with rows of different linens and maybe even lace… I just have to dream about it first…. Oh wow I love it. This is adorable. I saw that you listed it in the Someday Crafts giveaway directory but it appears that it is not a giveaway? ??? I do have a giveaway going on my blog for a $50 kirklands giftcard. Please stop by and enter. It is a giveaway, but it didn’t post last night like I thought it did? ?… it’s up now and this will count as an entry! Thanks!